The 13 Moon 28-day synchronometer is a harmonic timespace matrix. It takes the moon 28 days to orbit the Earth; it makes this orbit 13 times each year. 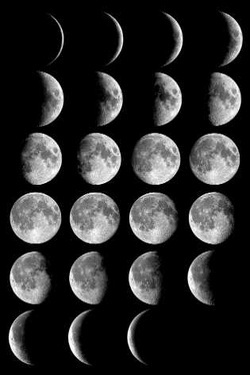 The standard of measure is the 28-day cycle, called a moon, because it is the median between the 29.5-day synodic cycle of the moon (new moon to new moon) and the 27.1-day sidereal cycle of the moon. Hence, it is a measure of Earth’s solar orbit using the 28-day lunar standard. This creates a perfect orbital measure of 13 moons of 28 days, totaling 364 days, or 52 perfect weeks of 7 days each. Because the 365th day is no day of the moon or week at all, it is known as the “day out of time” - a day to celebrate peace through culture and time is art!The natural cycle of physical time is governed by the movement of the Earth around the Sun in a circle. It is then divided by the movement of the Moon around the Earth in a circle, the 28 day cycle coded into the bodies of all women on the Earth. This is the cycle that governs the physical aspects of life. Men are coded with the 28 day cycle, as well, in the 28 day biorhythm cycle. This calendar also shows you the corresponding dates from the 260 day sacred calendar, the cycle that governs the spiritual aspects of life. The Dreamspell Calendar offers you the ability to access both the physical and spiritual aspects of time, in a very natural way already coded into the lives of everyone. It is also designed to serve as a conversion calendar from the old 12:60 time to the new time of 13:20, as it contains the dates which correlate it to the 12 month calendar everyone now uses, known as the Gregorian Calendar. You may ask, "If this cycle is so natural, why aren't we already using it?" Actually, all ancient indigenous peoples used this system long ago, not just the Mayans. The 12 month calendar commonly utilized today is known as the "Gregorian Calendar" because it was instituted by the edict of Pope Gregory in 1582. However, it is just an update of the original Julian Calendar, the calendar instituted by Julius Caesar as a calendar of conquest. In truth, Rome's purpose in imposing the Julian calendar on the people they conquered was to take away the power from the people and to give their power away to Rome. Invariably, this calendar was imposed on people who were utilizing the 28 day, 13 moon calendar system. These were people who were very in tune with nature, because of their connection to time as a natural cycle. To take their power away, Caesar imposed a false time upon them. A time which would take them out of step with nature. A time which would force them to look to Rome as their source of power. It was not until the early 1900s that the 12 month calendar was accepted as the world standard. So, in truth, 2000 years later Rome has conquered the world. And nobody even questions the accuracy of the calendar. This article was created using various research notes.